Everyone who has ever gotten a tattoo already knows that tattooing truly is an art-form, but this new trend is taking it to a whole new level. Watercolor tattoos are pretty much just what they sound like—permanent tattoos in the style of watercolor paintings. The ability to take this style of art and put it on the human body is nothing short of impressive, and I can’t wait to get myself my own beautiful watercolor tattoo. There are a few tattoo artists who are spearheading this trend, and taking a look at their work for the first time is pretty mind-blowing. Artists such as Ondrash, Aleksandra Katsan (@dopeindulgence on Instagram), and Justin Nordine are some of my favorites to browse, each of whom posts their amazing portfolios to Instagram. It seems as though many watercolor tattooists are artists first, and spend most of their time touring the world and tattooing in a bunch of different countries instead of settling at a single shop for the majority of their time. Instagram is a great way to find artists you’ll love, and searching for the #watercolortattoo tag is a great way to see the beauty of these pieces for yourself! Flowers, trees, animals, and birds all seem to be very popular subjects for watercolor tattoos, and they usually contain a little bit of abstract design. I’ve also seen some that are totally abstract, which make amazing use of the curves and lines of the body that becomes the tattoo artist’s canvas. The colors in watercolor style tattoos are more vivid than any other style of tattooing I’ve ever seen, and I am starting to prefer the tattoo version of watercolor over the traditional paint and paper version. 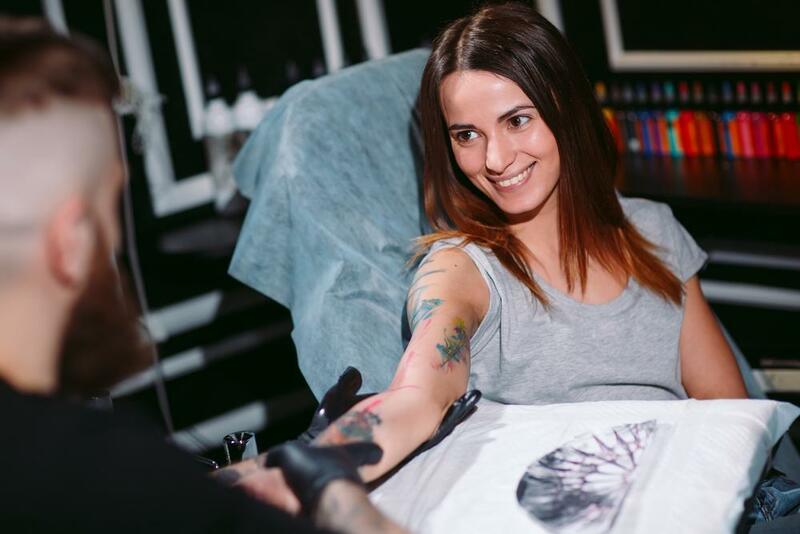 Just as it goes with getting any other tattoo, I imagine there’s a lot of collaboration between artist and client—though if you’re thinking of getting one, it might be best to rely pretty heavily on your tattoo artist’s advice. If you’re thinking about getting some of this beautiful ink, the most important thing is to do your research. Once you have an idea on design, make sure you’re looking into the health and safety standards of any tattoo shop you might be going to, and make sure you’re looking at many artist’s portfolios. This style isn’t super traditional, so it’s best to find somebody who specializes in watercolor tattoos. It may be a bit of a trend for now, but no doubt you’ll want to wear these beautiful pieces of art on your body forever! Marie Klickova is a lover of all things fashion and makeup. Follow Marie to learn her tips on hair-curling, eyebrow-lining and accessorizing. For tidbits and fun, she also chips in on the latest Hollywood trends.